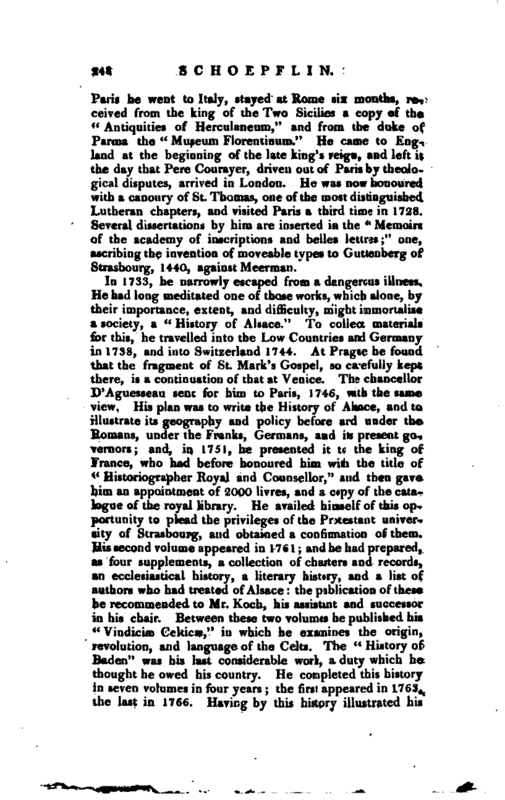 In 1733, he narrowly escaped from a dangerous illness, He had long meditated one of those works, which alone, by their importance, extent, and difficulty, might immortalise a society, a “History of Alsace.” To collect materials for this, he travelled into the Low Countries and Germany in 1738, and into Switzerland 1744. At Prague he found that the fragment of St. Mark’s Gospel, so carefully kept there, is a continuation of that at Venice. The chancellor D’Aguesseau sent for him to Paris, 1746, with the same view. His plan was to write the History of Alsace, and to illustrate its geography and policy before and under the Romans, under the Franks, Germans, and its present governors; and, in 1751, he presented it to the king of France, who had before honoured him with the title of “Historiographer Royal and Counsellor,” and then gave him an appointment of 2000 livres, and a copy of the catalogue of the royal library. He availed himself of this opportunity to plead the privileges of the Protestant university of Strasbourg, and obtained a confirmation of them. 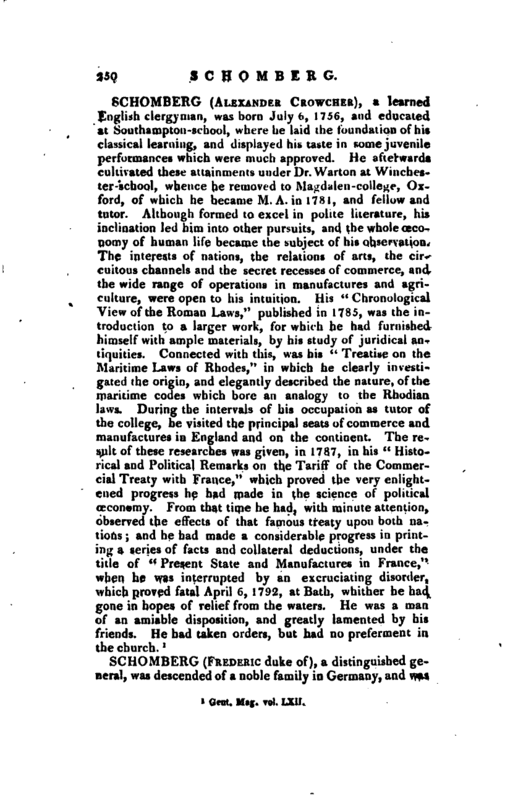 His second volume appeared in 1761; and he had prepared, as four supplements, a collection of charters and records, an ecclesiastical history, a literary history, and a list of authors who had treated of Alsace: the publication of these he recommended to Mr. Koch, his assistant and successor in his chair. Between these two volumes he published his ^Vindiciae Celticse,“in which he examines the origin, revolution, and language of the Celts. 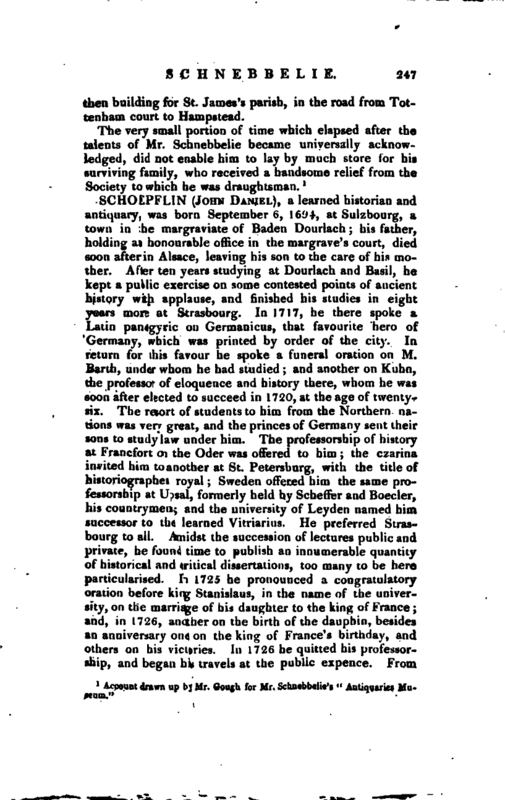 The” History of Baden“was his last considerable work, a duty which he thought he owed his country. He completed this history in seven volumes in four years; the first appeared in 176 3, the last in 1766. Having by this history illustrated his | country, he prevailed upon the marquis of Baden to build a room, in which all its ancient monuments were deposited in 1763. He engaged with the elector palatine to found the academy of Manheim. He pronounced the inaugural discourse, and furnished the electoral treasury with antiques. He opened the public meetings of this academy, which are held twice a year, by a discourse as honorary president. He proved in two of these discourses, that no electoral house, no court in Germany, had produced a greater number of learned princes than the electoral house. 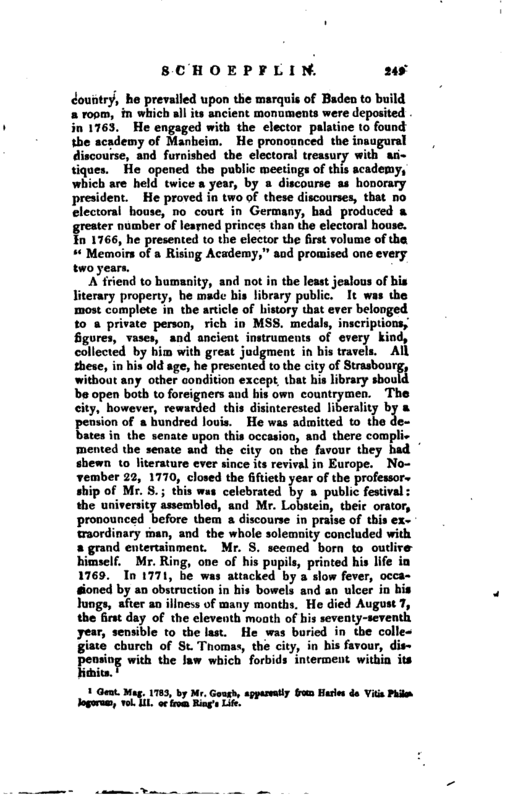 In 1766, he presented to the elector the first volume of the” Memoirs of a Rising Academy," and promised one every two years. 1 Gent. Mag. 1783, by Mr. Gough, apparently from H*rle dc Vitis PhiloJogorum, vol. III. or from Ring’g Life.